I want to be careful as I start this post. I'm aware that the vast majority of us understand that we must work incredibly hard at any endeavor if we are to succeed. What I'm really writing about is the articles, blogs, videos and websites that make it seem like we're idiots for working hard. You know the type - the guy who sends one email a day from the beach and makes €10,000 for it. I'm not saying that that is a bad business, or that you shouldn’t do it if you can, but I'm saying that we shouldn't feel less of ourselves for working long hard hours. I've always been a supporter of the philosophy "work smart, not hard” - who isn't? But I was struck by a comment made by Alec Baldwin in a video interview. Of course, it’s important that I mention that Baldwin was speaking in context of a 25 minute interview about the financial collapse of the world economy, so that this comment doesn’t seem out of context. He was obviously exaggerating for effect as the statement was too general, however, I think he has a point. And he's right. When an economy is based so much on financial service products that don't hold a steady value from day to day, it leaves us in a similar situation to what we had in 2008. Your house may increase or decrease in value as a house, but there is always a residual value in the fact that, it's a house and you can live there. The same can’t be said for financial products. A hard day's work is a noble endeavor. It always has been - particularly before the days when the financial markets and internet dominated society. And there's good reasons for that too. A person who works hard for their money is careful how they spend it. And often, the opposite of that is also true. Furthermore, it's a value that we ought to pass onto the next generation. The answer isn't always in the back of the book or on your phone, but if you go look for it, you'll find it. Maybe. 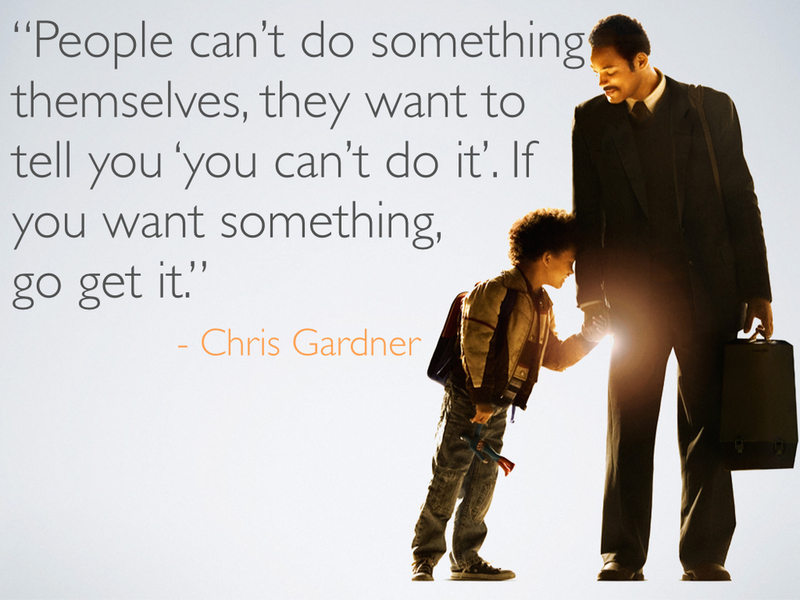 Source: "In Pursuit of happyness"
Dreams are great, keep having them and following them. Wishing you achieve them won't make them come true, grit, persistence and hard work will improve your chances. Will Smith inspires me. He attributes his success to his work ethic and you have to admire him for it. So, hard work is great. But working long and hard hours without a good strategy is foolish. We must also work hard to find the right way to succeed. Then, if it’s not working, we must find alternatives rather than just stoically refusing to be defeated. I wrote this for people who are interested, for people who care, and for those people who need it... people like me.